Editorial note: I originally wrote this post for the Submain blog. You can check out the original here, at their site. Put two developers together and they’re bound to have a discussion about coding style. No two developers write code in the exact same way. More often than not, one isn’t better than the other and it’s just a matter of taste. In a team or in a single project, it’s more important to be consistent than it is to choose the right style. Agreeing on a style can be hard enough, but enforcing it shouldn’t be something you do manually. It will be tedious and error-prone. StyleCop is a tool that can automate this. Let’s have a look at how to set it up and what it brings to the table. We’ll get into what this means exactly, but first a little word about the “old” and the “new” StyleCop. 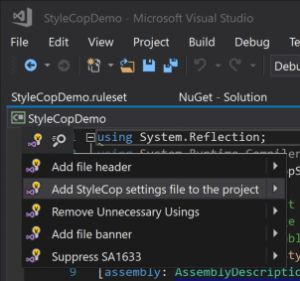 StyleCop used to be a Visual Studio plugin and a NuGet package. You can still use this in Visual Studio 2017, but the current recommended way to use StyleCop is to use the Roslyn-based analyzers. These analyzers will continue to be supported in the future, whereas the Visual Studio plugin and the NuGet package will no longer receive any major improvements. So for this article, I’ll focus on the StyleCop Analyzers project. StyleCop provides a way of identifying all places in your code where these one-liners occur and optionally enforcing the multi-line statement by not allowing the project to be built. The merits of the above example are something to discuss with your team, but every team should have guidelines on how they choose to write their code. This increases readability and predictability, making your daily lives a lot more pleasant and helping you avoid useless discussions. These guidelines can range from whitespace rules to member-naming guidelines and from the order of members in your file to XML documentation guidelines. Whichever style guidelines you choose, StyleCop will allow you to enforce them automatically. So how do we get started with StyleCop? If you want to know more about a rule, click on the code and your browser will open a page with documentation on the rule. // Copyright (c) PlaceholderCompany. All rights reserved. You might not agree with all these rules. Luckily, you can tune StyleCop to your own needs. 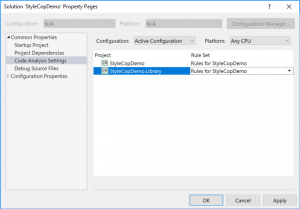 Configuring StyleCop is done in two optional steps. First, you can use rule set files to configure what rules are checked and how strongly you feel about them. Second, you can add a stylecop.json file to your project to fine-tune some rules. “Warning” means a violation will be shown as a warning when building the solution. “Error” means a violation will be shown as an error. This also means you’ll see the red squiggly lines in the editor, and the build will fail. “Info” means a violation will be shown as an information message. “Hidden” means the rule is still checked, but you won’t see it in Visual Studio. This setting is more for use in custom tools than in Visual Studio. “None” means the rule will not be checked. This is, in essence, the same as deselecting the rule. <Inherit> means the action will be inherited from the rule group. You can specify an action at the level of a rule group too. If you change any of the settings in these default Microsoft rules, it will create a new rule set file and add it to the project. This is now the rule set for your project. Later in this article, we’ll cover solution-wide rule sets. The default Microsoft rule sets are a great starting point. By customizing them for your project, you can have an automated analysis that fits your need with little effort. Be sure to add the resulting .ruleset file to your source control system, and let it evolve as your needs evolve. The “$schema” property is to provide IntelliSense. The “settings.documentationRules.companyName” will be used to automatically create a copyright notice when you fix rule SA1633. Now that that’s done, you can add the file header again, and you’ll see the correct copyright notice. The stylecop.json file allows quite a lot of configuration. Be sure to check out the documentation because it’s too much to handle here. But I will provide one example. The Microsoft guidelines tell you to put the using statements inside the namespace declaration. Because Visual Studio puts them outside the namespace by default, most developers I know consider this awkward. So let’s configure StyleCop to prefer them outside the namespace. Once again, be sure to check out the documentation to see what’s possible. But don’t worry about getting everything right the first time. Often, the default values are what you want. If not, discuss this with your team and choose the configuration you agree on. Once you have your rules all set up, you have an automated way of checking for style violations. This is important if you want to avoid manual and time-consuming inspection. And keeping your code consistent makes it predictable and more readable. This, in turn, makes developers more productive and generally less frustrated. Coming to an agreement can sometimes take lengthy discussions. But often, the exact rule isn’t as important as it is to have a rule and not violate it. So whether or not the opening curly brace is on the same line or a new line isn’t very important. What is important is that you stick to the convention for your team or project. However, that often leads to some frustration when developers see the build failing on issues they don’t regard as being a problem. A better approach would be to identify the rules you have no or few violations against and change the action from “Warning” to “Error.” Fix the few violations and agree with your team that, from now on, those rules will be breaking the build. Then incrementally increase the number of rules that result in an error until you feel you’ve reached a point where the code looks and reads the way you want. This approach gradually makes the build stricter and stricter without angering your fellow team members. Inevitably, you’ll encounter specific cases where you deliberately want to violate a rule. Let’s say we have a class that contains public fields—something rule SA1401 warns against. We’re going to assume we have some legitimate reason that this cannot be a property. Some legacy library might use reflection to get the value of all fields, and this library might be out of our control. As you can see, we have the option of suppressing it directly in the .cs file or in a separate file. The first line we added disables rule SA1401 for all code that follows. The rule remains disabled until the rule is restored again, which happens in the second line that we added. If we choose to suppress the error in a suppression file, a GlobalSuppressions.cs file is added to the project. In that file, an assembly attribute will have been added. This attribute gives you a little more control than the previous technique because you can scope the suppression. You can also scope to a specific namespace. Finally, notice how you can provide a justification, which more clearly communicates to other developers why it’s a good idea to suppress the warning. In our example, we only added StyleCop to a single library; we added all files to the library. But most solutions consist of multiple projects. 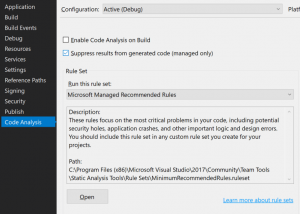 In order to use one rule set file for the entire solution, in Visual Studio you can go to Analyze > Configure Code Analysis > For Solution. In such a case, I would recommend moving the rule set file outside of the project and adding it as a solution item. You can do this by first placing the rule set file next to the solution file (using Windows Explorer). Then right-click the solution in Visual Studio and select “Add existing item.” Finally, select the rule set file and configure your solution analysis with the dialog shown above. You can use a similar technique for the stylecop.json file. First, put the stylecop.json file next to the solution file. Then right-click on each project and select “Add existing item.” In the file dialog, choose the stylecop.json file, but don’t click on the “Add” button. Rather, click on the dropdown and select “Add As Link.” If you just click “Add,” you’ll create a copy of the file for each project. Any changes to the stylecop.json file would have to be done for each project. When you add it as a link, you keep one copy of the file and only have to edit that one. Have a consistent style, and have it enforced automatically; it’s a great step forward to writing maintainable and readable code. But it doesn’t stop there. 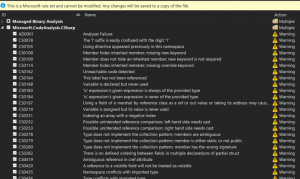 Automating your code quality analysis also includes things like detecting dead code, calculating cyclomatic complexity, and identifying security issues. One last word of warning. Too often, I’ve seen teams lose productivity because of rules they don’t agree with. Or maybe they used to agree with them, but times have changed and so have opinions. As an example, I’m thinking of a company where the “var” keyword wasn’t allowed…in any project. This company-wide rule seemed set in stone and frustrated developers wanting to use modern language features. Teams should come to an agreement on which rules they want to enforce and how severe violations are. And when opinions change, rules should follow. The idea is to let StyleCop do the work for you and enable you to have a clean, consistent codebase with minimal effort. But the definition of clean and consistent can change over time. I’ve provided a fairly complete guide to help you get started with StyleCop. So get together with your team and talk about how you want your code to look. Then set up StyleCop with some rules and move on from there. You’ll see the quality of your code improve. Good luck!